Celebrate with a chocolate milkshake. Photo courtesy Cherry Marketing Institute. Today we know a “milkshake” as a cold beverage made from milk, ice cream and often, syrup, served in a tall, fluted glass with a straw (the classic milkshake glass is known as a Y glass). Some establishments top the drink with whipped cream and other garnishes. The Random House Dictionary describes a milkshake as an American creation, “a frothy drink made of cold milk, flavoring, and usually ice cream, shaken together or blended in a mixer.” And it states that the first printed reference dates to 1885. MILKSHAKE HISTORY: ALCOHOL, NO ICE CREAM! Yet, the milkshake still contained no ice cream. The modern milkshake was born in 1922, when an employee at a Chicago Walgreens, Ivar “Pop” Coulson, was inspired to add two scoops of ice cream to malted milk. Malted milk was a drink made by blending milk, chocolate syrup and malt (malt was invented in 1887—as a nutritional supplement for infants). The malted milkshake shot to stardom nationwide. By the 1930s, soda fountains were known as “malt shops.” In 1937 two milkshake-worthy events occurred: A superior blender was invented by Fred Waring, and the flexible straw was invented by Joseph Friedman. But not all milkshakes were malted milkshakes. Many people preferred their milkshakes malt-free. By the late 1930s, the term “frosted” was being used to describe maltless milkshakes that blended ice cream and milk into one smooth drink, while a “float” had scoops of ice cream “floating” in milk. Soda fountain owners also came up with their own names. In New England, milkshakes were variously called frappes (Massachusetts), velvets, frosteds and cabinets (Rhode Island, referring to the freezer cabinet from which the ice cream was scooped). Someone in a drive-through restaurant in St. Louis invented the concrete, a milkshake so thick that it was handed out the order window upside down for a wow factor. (We’ve had a few, and would argue that the concrete is not really a milkshake, but ice cream that’s been blended with just enough milk to turn it into a malleable form. It needs to be eaten with a spoon: It’s so thick it can’t be drunk through a straw). No one knows what the next milkshake evolution will be, but we recommend going back to the original. Hold the egg, but add some Godiva Chocolate Liqueur to celebrate National Chocolate Milkshake Day (or a shot of whiskey, perhaps). Don’t like chocolate? Mark your calendar for June 21st, National Vanilla Milkshake Day. *Source: Stuart Berg Flexner, Listening to America (New York: Simon & Schuster, 1982) p. 178. 2. POUR into a tall glass, garnish as desired and serve. Whipped cream, a maraschino cherry or other garnish is optional (and overkill). In the 1950s, a milkshake machine salesman named Ray Kroc bought became the exclusive distributor of a speedier milkshake machine, the Multimixer. He inadvertently invented modern fast food with his vision of franchising the McDonald’s hamburger stand in San Bernardino, California—just so he could sell several Multimixers to each location! A float, also known as an ice cream soda, is a carbonated soft drink—cola, root beer, etc.—with one or more scoops of ice cream “floating” in it. 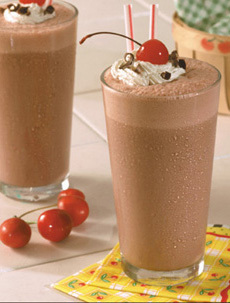 A milkshake, “shake” for short, is a blend of ice cream, milk and flavoring. The scoop of ice cream is blended into the milk; you can’t see the ice cream. A malt, short for malted milk, is a milkshake with added malted milk powder. The powder is made from a mixture of malted barley, wheat flour, and evaporated whole milk. It was originally developed, in 1897, by a pharmacist, James Horlick. He intended it as a gruel—a nutritional supplement—for infants. Soon enough, parents discovered how tasty it was…and the rest is history.